Sardine Greek Salad - A recipe from Savor California, the online showcase for extraordinary gourmet foods and beverages from California. In a large bowl, mix together the tomatoes, cucumber, red onion, Kalamata olives, feta cheese, olive oil, red wine vinegar, dried oregano and freshly ground black pepper. 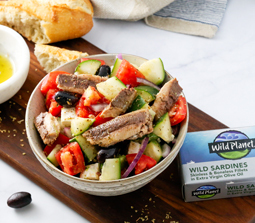 Add the Wild Planet Wild Sardines Skinless & Boneless Fillets in Extra Virgin Olive Oil and lightly toss before serving.